Pasted and propped along the banks of the Nairobi River in Kenya’s capital, Kibera’s illegally constructed houses are packed together so densely you can barely see a sliver of the red dirt holding them up. Though estimates vary greatly, between 500,000 and 1 million people likely live in this 1-square-mile (3-square-kilometer) settlement. The poorest are forced to build atop the banks of the river, which overflows with a slurry of fast-moving raw sewage and trash that inevitably destroys homes and claims lives during the rainy seasons that occur twice a year. Until recently, residents’ only protection against this often-lethal water channel were the construction of hundreds of crude, hand-carved drainage canals snaking from Kibera’s high ground to the marshy, undeveloped basin of the Nairobi River and other feeble measures, such as blocking floodwater with trash. 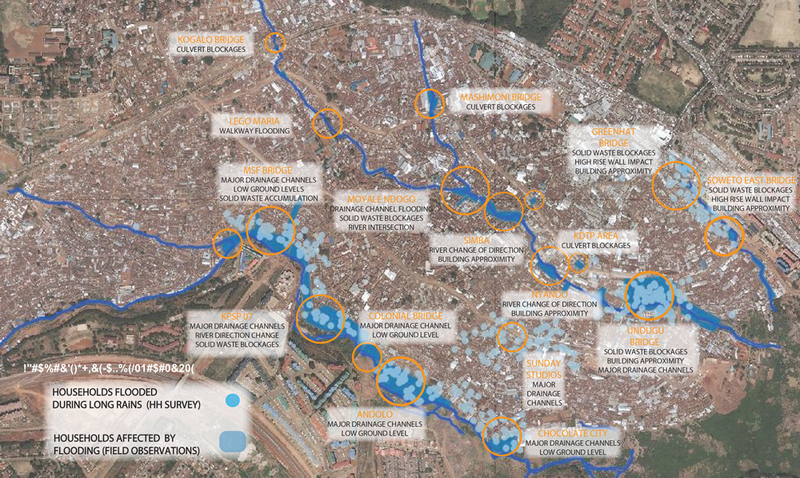 Then, in 2015, a small group of architects, designers and engineers at Kounkuey Design Initiative decided to combine their expertise in urban planning, sustainable design and community outreach to solve the grand challenge of preventing flooding in Kibera — and hopefully beyond. Headquartered in Los Angeles, California, KDI has as its mission answering the question, “Could design be useful in big challenges of poverty and environmental degradation?” says executive director and co-founder Chelina Odbert. Current projects range from building community hubs such as recreation areas, shared gardens and market kiosks in Haiti, to engineering toilets that transform human waste into sellable fertilizer in Kenya, to providing holistic development plans for villages in remote parts of Ghana. While KDI has almost a dozen projects across the United States, Caribbean and West Africa, its work in Kibera has been the most extensive, with seven public-space projects focused on income generation, food security, water and sanitation, and women’s empowerment. But KDI’s approach of creating productive, community-anchored public spaces wasn’t an option in much of Kibera. KDI decided to focus much of its efforts on another major problem in Kibera: flooding. Historically, flood issues have been a low priority in Kenya, especially in informal settlements such as Kibera where investments in basic infrastructure such as roads and trash collection are ignored because the government considers residents to be illegal squatters. 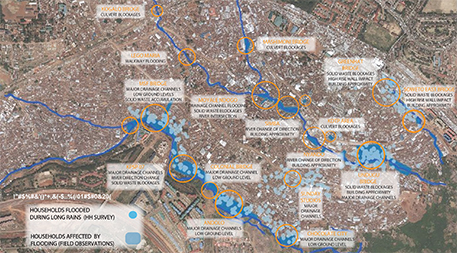 From March to August 2015, KDI conducted lengthy interviews in 1,000 Kibera households, used cellphone mapping software to carefully gather data about past floods, documented local preparation and relief tactics, logged flood-related damages and deaths, captured locational photographs, uploaded information into geographic information system — GIS — software, and traced routes of hundreds of poorly placed drainage channels running through Kibera. Analyzing the data, the KDI team discovered to everyone’s surprise that up to 50 percent of households at the top of Kibera experienced flooding during the rainy seasons —almost the same proportion as those living at the bottom, despite a 190-foot (58-meter) difference in elevation. “For us, it showed that flooding wasn’t just happening from the river, but it was also because of the major drainage channels coming down from the roads,” KDI volunteer engineer Anna Collins explains. The team quickly recognized that Nairobi’s recent blitz of road construction, which greatly increased the amount of flat surfaces in the region but only included a few drainage channels funneling toward Kibera, was contributing to the flooding. “People assume that the flooding problem comes from the river, but to see how much of that comes from the drainage — this data brings to light so many problems that wouldn’t be intuitive,” Odbert says. Odbert says the robust data sets and resulting detailed maps have allowed KDI to advocate for county-level flood prevention strategies by bolstering partnerships between KDI and Nairobi public works departments to identify inefficient drainage channels and determine practical solutions for flood prevention. “I think the reason there’s been so much success in working with the [local government] is because it’s clear that KDI has been able to provide information that [the local government] can’t,” Odbert says. KDI is also partnering with Kibera community groups and local nonprofits to provide flood preparedness workshops for residents such as David Onyando, who collects trash for a living. In the past Onyando has used garbage to block water from entering his home. After attending KDI’s training, he says he’s open to using small structural modification techniques such as widening rain channels and using sandbags to divert water in order to cope with floods. “Flooding becomes a collective responsibility because in Kibera, you can’t do it alone,” says Onyando. KDI team members say their thorough data collection, close community ties, and ability to provide critical data to the government that it otherwise would not have without duplicating services has given the team an invaluable position in the community. It’s also allowed them to develop and test a strategy for boosting urban resiliency that could be shareable and scalable outside of Kibera, too. For Kibera, the ultimate solution will include using detailed data sets to identify flooding hot spots, over- or underutilized drainage channels, and any informal systems used to mitigate flooding; working with local government entities to plan and construct new drainage pathways based on data and GIS mapping software; documenting and quantifying property damage and deaths due to flooding; and creating a grand map illustrating the overall flow of Nairobi’s surface, drainage and river water in an attempt to better prevent floods in Kibera. 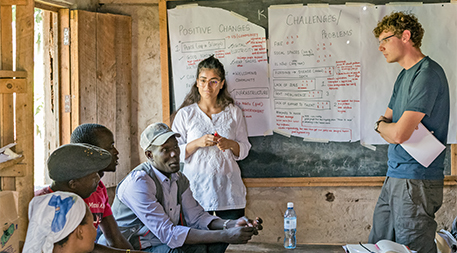 Mulligan and Odbert say their team will continue providing grounded, tangible and community-led results from their work on flooding, all in hopes of improving quality of life for Kibera’s residents — and, ultimately, others around the world as well.